Nothing ever causes me such consternation as the reluctant three-star rating. I sometimes worry that I give too many but to be fair, three stars is average and by very definition most books are going to be average. But there are some books out there that I suspect I would enjoy more if I read them in a different time and place, if I were a member of different demographic, if I had different life experiences. In my former life as a bookseller, I tried very hard to remember that customers wouldn't always have the same taste in books as me and sometimes the right recommendation was for a book that I didn't particularly care for. 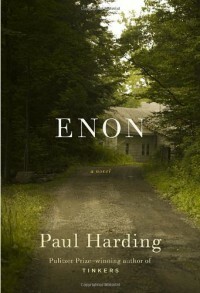 If I still worked in a bookstore, Enon might be one of those books. Paul Harding won the Pulitzer in 2010 for Tinkers, a novel that kind of came out of nowhere, about the ruminations of a dying man. I didn't read it, because I'm not one to jump all over award winners and because it just didn't sound like the kind of thing that would resonate with me. Still, I was intrigued when I found his follow-up on NetGalley. Here Charlie, the grandson of the protagonist from Tinkers, must deal with the sudden loss of his thirteen-year-old daughter. Charlie and his wife have predictably divergent grieving processes and so it comes as no surprise that she moves back to her parents' home in Minnesota, leaving Charlie alone in Maine, a man without a family. He doesn't handle it all that well. This book is sad as hell, but you know that going in. And it means there's some lovely writing these brief pages but Harding doesn't let it cross into emotionally manipulative territory. And yet -- there's nothing particularly new here. It's all territory that's been well-worn by many other writers and Harding just doesn't offer anything fresh. I felt like there was a superlative novel bubbling underneath the surface, but Harding didn't quite push it through. At the same time, I don't doubt that there is an audience that will be able to more fully relate to Charlie and will find that this book resonates.